In case you missed it, a glimpse into Microsoft’s cloud infrastructure used to power Lync, Exchange, and SharePoint in Office 365. A major upgrade is now available to my popular OCS and Lync Sign-In Troubleshooting Tool. 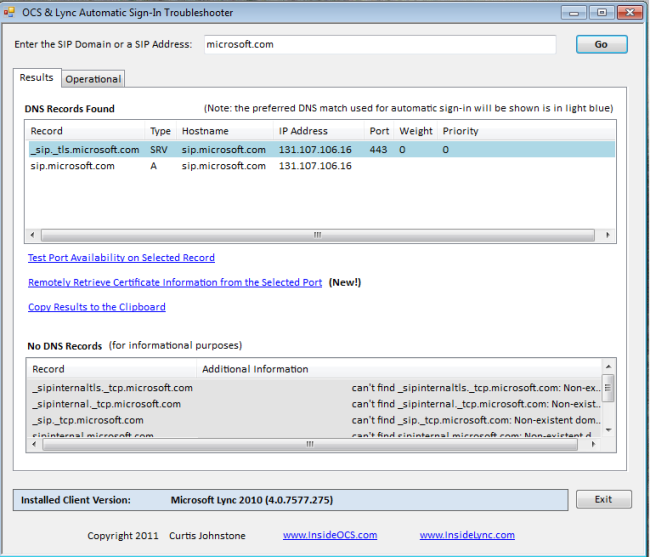 This is a small free tool to help troubleshoot client-side Communicator and Lync sign-in issues (see The OCS 2007 Automatic Sign-In Troubleshooting Tool V2.0 for more information on previous releases). In addition to several bug fixes, Version 3 of the tool now supports remotely retrieving certificate information from the TLS port on the OCS or Lync server where the client will connect (based on the matching returned DNS records). This will be a major help when trying to debug sign-in issues. Thanks to all the users who have reported bugs. Retrieving the installed version of Lync or Communicator now works on x64 along with a few other issues. A new firmware update for the Microsoft RoundTable was released on June 15, 2011. You can download it here: http://www.microsoft.com/download/en/details.aspx?id=17500. It is just over 18 Mb. The list of issues it addresses can be found in KB article 2559123: http://support.microsoft.com/kb/2559123. This is not Microsoft OCS/Lync news per se, but in case you missed it, this morning Microsoft has entered into an agreement to acquire Skype: http://www.microsoft.com/Presspass/press/2011/may11/05-10CorpNewsPR.mspx. This is exciting news – the acquisition in itself significantly extends Microsoft’s Unified Communication’s reach to many more millions of people world-wide, and the potential of integration with Microsoft Lync, the Office platform, and other Microsoft devices is powerful. From the press release: “Skype will support Microsoft devices like Xbox and Kinect, Windows Phone and a wide array of Windows devices, and Microsoft will connect Skype users with Lync, Outlook, Xbox Live and other communities. Microsoft will continue to invest in and support Skype clients on non-Microsoft platforms”. 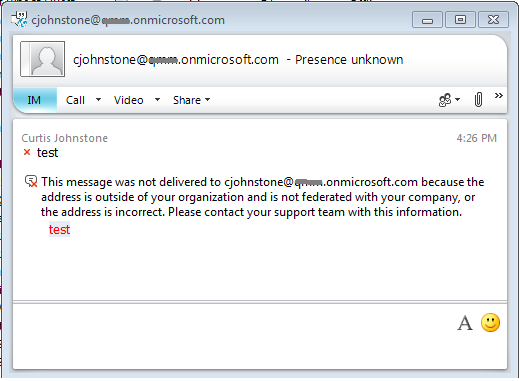 The thought of potentially having Skype users in my Lync client and vice-versa is appealing! When you create the OCS 2007 R2 user to be used for the Polycom HDX 8000 (aka Conference Room User), a key requirement is that this OCS 2007 R2 user CANNOT be fully enabled for Enhanced Presence (by full enabled, I mean that the OCS R2 has the “Enabled enhanced presence” checkbox enabled on their account AND have logged in at least once with Office Communicator 2007 or Communicator 2007 R2). The user can have the Enhanced Presence checkbox enabled, they just must not have signed into OCS 2007 R2 with a Communicator 2007, 2007 R2, or Communicator Web Access (in OCS 2007 R2). When you create a new user in OCS 2007 R2 this Enhanced Presence checkbox is enabled by default. 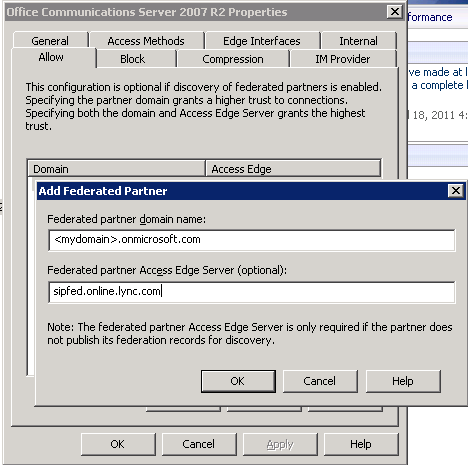 The state that the OCS user is in before they sign into OCS at least once with Communcator 2007 or 2007 R2 is referred to as “Stage 2″ in this blog article which describes the 3 stages an OCS account can exist in regards to enhanced presence: http://blogs.technet.com/b/lync/archive/2008/03/06/differentiating-between-stages-of-enhanced-presence.aspx. For the adventurous spirits out there, I attempted to ‘revert’ the OCS 2007 R2 Conference Room User from Stage 3 to Stage 2 by changing the associated “RichMode” value to False for the user in the OCS database, and this did not work. I believe signing in the first time with Communicator 2007 or 2007 R2 also changes some other settings. Also, if you encounter this error “The registrar has rejected the system’s attempt at registration”, Jeff Schertz has a good blog write-up on why this could be happening and how to resolve it: http://blog.schertz.name/2011/01/hdx-sip-registration-with-server-2008-r2/. A quick tip to anyone integrating a Polycom Room Telepresence solution (e.g. the HDX series) with Microsoft OCS 2007 R2. If you are having trouble signing into OCS 2007 R2 with the OCS conference room user on the Polycom unit, read-on, and consider upgrading the software on the Polycom. Older Polycom software had a requirement that the OCS 2007 R2 user used with the Polycom unit (aka ‘Conference Room User’) COULD NOT be fully enabled for Enhanced Presence. By “fully enabled” I mean that the “Enabled enhanced presence” check-box was enabled on the OCS account AND the account has been logged into at least once with Office Communicator 2007, Communicator 2007 R2, or Communicator Web Access. Once the OCS 2007 R2 conference room user was enabled for enhanced presence and had logged into OCS 2007 R2 at least once, the Polycom unit could not sign-in. Enhanced Presence is supported on newer software releases for the HDX units (for awhile now). Recent Polycom support guides and software downloads can be found at the bottom of this page: http://support.polycom.com/PolycomService/support/us/support/strategic_partner_solutions/microsoft_software_download.html. The latest version of the Microsoft UC Integration Guide that covers both Lync and OCS is available here: http://support.polycom.com/global/documents/support/setup_maintenance/products/video/Deploying_Visual_Comm_Admin_Guide_WV4.pdf. Some older Polycom guides still show in Internet searches and are out-of-date, such as this one: the Polycom® HDX and RMX™ Systems Integration with Microsoft Office Communications Server 2007 Deployment Guide. A Refresher on the Multiple States of Enhanced Presence: When a new user is created in OCS 2007 R2 the Enhanced Presence checkbox is enabled by default. The state that the OCS user is in before they sign into OCS at least once with Communicator 2007 or 2007 R2 is referred to as “Stage 2″ in this good blog article which describes the 3 different stages an OCS account can exist in regards to enhanced presence: http://blogs.technet.com/b/lync/archive/2008/03/06/differentiating-between-stages-of-enhanced-presence.aspx. Tip: For the adventurous spirits out there, I attempted to ‘revert’ an OCS 2007 R2 Conference Room User from Stage 3 to Stage 2 by changing the associated “RichMode” value to False in the OCS database, and this did not work. I believe signing in the first time with Communicator 2007 or 2007 R2 must also change other settings which cannot be reverted. Also, if you encounter this error “The registrar has rejected the system’s attempt at registration“, Jeff Schertz has a good blog write-up on why this could be happening and how to resolve it: http://blog.schertz.name/2011/01/hdx-sip-registration-with-server-2008-r2/. For more on OCS 2007 R2 Enhanced Presence see the InsideOCS blog post: Enhanced Presence and Upgrading Communicator Clients.